If you haven’t heard about what I’ll playfully call the “Creeper Case” in Westfield, New Jersey, let me enlighten you. Derek and Maria Broaddus were million dollar buyers who were smitten when they found a home in The Garden State. Not soon after they closed on their new home for $1.4 million (pictured below), they started to receive disturbing letters by someone who calls themselves “The Watcher.” It didn’t take long for the Broadduses to learned that they had purchased a home that had an obsessed stalker. 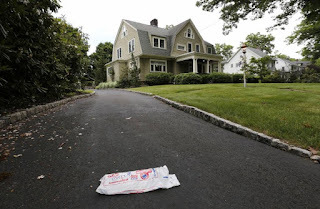 These letters have prompted the Broadduses to sue the sellers for not disclosing the fact that there is someone who has as mentally disturbed fixation on the house. I know. Gross. The fact that someone takes pleasure out of writing words like these to a family is beyond me but that’s not what I’m here to discuss today. When I read this article I thought about my own experience with disclosures in my real estate career. I’ve yet to go on a listing presentation without a seller asking me questions like, “should I disclose this leak even though it’s not active?” or “should I tell them that we had an ice dam?” It’s not uncommon and I’m not without my opinions. In the case of the Broaddus family, if I was the listing agent trying to counsel the seller, my advice would be as follows: disclose. And here’s why. In a private sale (meaning a seller is not using a real estate agent), the seller doesn’t have to disclose anything except for lead paint but if directly asked, they are not to mislead buyers on anything with the home. Introducing an agent invites stricter rules. In a sale where a real estate agent is involved, agents are legally required to reveal knowledge of the property even if it’s not in the best interest of the seller such as the basement gets water or the fireplace doesn’t work. In this particular case where a serious safety issue has been introduced, I believe the right thing is to disclose it to anyone with serious interest in the property. Whether or not the buyers have legal grounds to go after the seller will have to be the decision of a judge who has a far greater understanding of the law than I. Whatever the outcome an suit like this begs the question, in a market where it is no longer “buyers beware,” how much should sellers have to disclose? The Broadduses are currently trying to sell the home since they feel unsafe. They are seeking a refund for the total purchase price plus additional punitive damages. By the way, they are also going after the insurance company and the settlement company but not the listing or buying agents.